1. What is Connection Object in ADO.Net? 2. What is Connection String? 3. How to Store Connection String in web.config and App.config file? What is Connection Object in ADO.Net? Connection String combines all the required authentic information that is used for connecting to a Data Source, like Server Name, Database Name, User Name, Password etc. It is just a single line string that is used by connection object to connect to the database. A connection string looks like this. How to Store Connection String in web.config file? In order to connect with Database, it is mandatory to keep connection string in a safe and centralized location. It is not recommended to writing connection string in each and every connection. You can store the connection string in Web.config file, app.config file or into a class file. 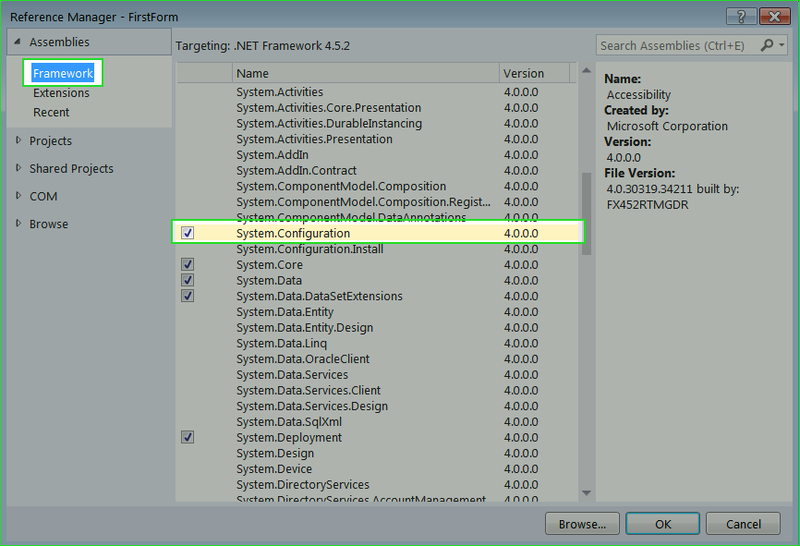 If you are developing ASP.Net Project or ASP Web Project then you can store the connection string in Web.config file. If you are working on the windows form, you can save connection string in App.config file. If ConfigurationManager Object does not appear or giving reference error, then you should add reference to ConfigurationManager Object like this. 2. 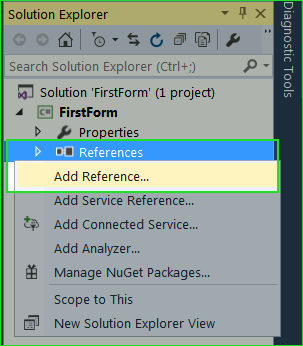 Reference Manager window will appear. Here, Choose Framework in left panel and then find and check System.Configuration in Middle Panel. 3. Click OK to add Reference. There are 5 steps to connecting database. 2. Create Connection Object and Pass Connection String as Parameter. In this chapter, I tried to make you understand Connection Object and Connection String in ADO.Net. You also learned how to store and retrieve connection string from web.config file or App.config file. In the next chapter you will learn how to Create, Select, Delete or Update database using C# ADO.Net.